For Copenhagen’s residents, Kihøskh really needs no introduction. This organic corner shop that boasts an impressive selection of international magazines, organic croissants from the bakery Brød, a world-class selection of bottle beer and a healthy choice of cactus for heaven’s sake, it is no ordinary corner shop. This compact pearl has been attracting beer enthusiasts from around the globe for some time and as my host, Simon, pointed me in the direction of the cellar, I understood why. Labels representing microbreweries on both sides of the Atlantic stood proudly on parade. A gentleman from Oregon, misty-eyed, studying the merchandise, had obviously discovered a distant memory. I discreetly left him to it. Simon had another surprise installed for me. 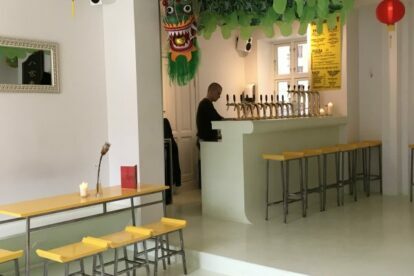 The recently opened café and beer bar, RBABARRAB – try pronouncing its name only after several drinks – is an interesting extension to the Kihøskh concept, boasting 15 pumps with special local and international brews in an eye-catching interior highlighted by a 10m long Chinese dragon hanging from the ceiling just to give it an extra touch. Keld Pedersen, the man behind Kihøskh, Brød and now RBABARRAB has interpreted astutely the role of the corner shop providing the lucky urban dwellers of Vesterbro with a unique shop experience. For those planning a beer tasting safari in the Danish capital, Kihøskh and Rbabarrab should be on your list.